Hijacking the thread! In TrippleA, if all chinese territories are conquered by the axis and are Axis controlled during one round, then liberated by the allies, doesnt china get to place troops again? Sorry, bad link, fixed it! This is how i made it, I think it will work ok! The OOB map is definitely wrong to label the beige northeast corner of the island of Ireland as being part of Scotland – a gaffe that probably annoys the Scots as much as the Irish – and I also find that the map confuses things further by putting a British roundel on top of the straight that separates Ireland from Scotland, thus creating the impression that they are part of a single land mass. So in that respect, Der Kunstler’s customization is quite helpful. I think a further improvement would be to modify Ireland (which DK correctly shows to be an island) to make it look the way the Iberian Peninsula is depicted on the map: much of it consisting of Spain, which is one of the three types of neutrals in the game, but with a British enclave (Gibraltar) in one corner of its territory. “Ireland” is the name of the island as a whole; Eire is the name of the pro-Allied neutral Irish Republic that comprises most (but not all) of the island; and the British northeast corner of the island is called Northern Ireland. That would be strictly speaking the most historically accurate treatment – though not necessarily the optimal treatment in terms of game simplicity. Thanks for the proper info on that - IMO Northern Island is so small that for gameplay purposes it causes more problems to have there than it solves. I agree with that, dont really see the strategic value for gameplay purposes either with a Northern Ireland. Tho i really think Scotland plays a role and i will keep it! What do you guys think of the SZ border if Ireland is a single neutral territory island? Should the SZ border meet with the Scotish/UK land border or just meet the Scotish border so you can go from SZ 109 to Scotland? Thanks, i will do the same! How did you draw the border from Ireland to UK mainland? 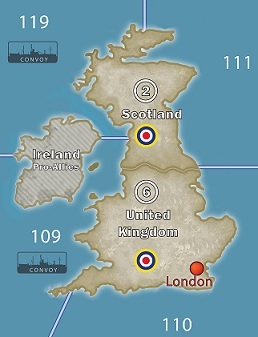 If it meets the border between Scotland and UK it means that you cant go from Scotland to SZ 109 which you can on original map. Or did you draw it to meet only the Scotish coastline so Scotland still borders SZ 109 by the Irish sea? Just to ceheck, is northern Ireland a part och Scotland and therefore you can move a land unit from Eire to Scotland? Whould it be to change the game to much if Eire was just Eire and was really an Island? Updating my map in PS! I like an Anzac bomber to prevent easy JP shippings if US cant handle it! Do you usually build up a small force and then take it to action or advance all units every turn as u build them? Thanks, i asumed that would be the answer! But in the reality, didnt GE perform attacks on US cargo ships before US made their DOW on GE? People keep saying, u can divide a single convoy dice between 2 countries. Basically, a lone destroyer can convoy 2 from egypt, and 1 from TJ if it rolls a 3. I was under the impression that this is not possible. I believe you can only convoy disrupt up to the value of the bordering territories in that sz for each power controlling it. So assuming Egypt and TJ were owned by the same power then yes 1 destroyer could disrupt for 3 if it rolled a 3. If differing powers owned the territories then the destroyer could disrupt on each of those powers turns but only up to the value of the territory they control. Hope that helps and I believe I am right, but I’ve been wrong before. Just ask my wife! Seems to me the most logical answer! How could you convoy hunt a power who is not at that time collecting income?!?! Is convoy hunting a DOW? For example, if GE moves subs to US coast and convoy hunt US1, is that a DOW on US?